Manufacturing processes by their very nature require a judicious, time-dependent use of pressure and temperature to transform a base material into a valuable commodity. Modern manufacturing with its globalized supply chain demands ever exacting controls over the manufacturing process to ensure uniform consumer experience. While the manufacturing process has seem rapid evolution over the past decades, the metrology infrastructure has failed to keep pace; for example pressure, a key measurement parameter that provides critical information on the changing conditions of a process or system needs to be measured with microsecond time resolution. However, at the present a traceable dynamic pressure standards does not exist. Currently, dynamic pressure sensors are calibrated against static pressure and are tenuously assumed to maintain perfect linearity. We have initiated a comprehensive research effort to establish the first traceable measurement infrastructure for dynamic pressure, including measurement standards, sensing technologies, and dissemination mechanisms. This infrastructure will utilize optical technologies that take advantage of advances in the telecommunications industry and frequency metrology. Membrane (shiny hemisphere at center) mounted on high-pressure side of shock tube. 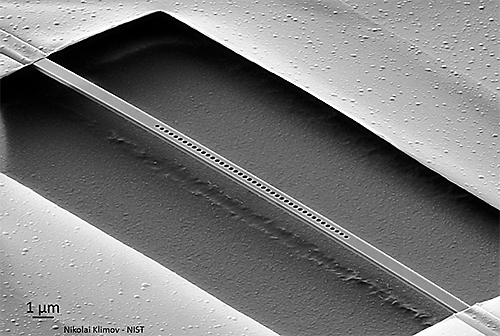 Suspended photonic crystal nanobeam cavity nanosensor. Measurement Platform: We are developing a photonics based dynamic pressure measurement platform that will enable traceable, accurate measurement of dynamic pressure. To this end we are developing fast scanning laser absorption spectroscopy techniques that enable rapid measurement of pressure-broadening of a molecular ro-vibrational transition. This approach reduces pressure measurement to fundamental examination of the impact of molecular collisions on the resonant light-matter interaction, a quantum phenomenon, enabling a traceable measurement of pressure that is rooted in frequency measurement. Dynamic Pressure Sources: We are investigating a range of dynamic pressure sources for creating reproducible dynamic pressure events at repetition rate that is economically feasible for deployment in the market place. Currently we are investigating the use of low Mach number shock tubes and fast opening valves for creating reproducible dynamic pressure fronts. Sensors: As part of our effort in building up the measurement infrastructure we have taken a two-pronged approach to sensor development. Utilizing our repeatable dynamic pressure sources we are characterizing the response of traditional piezoelectric transducers and photonic Fiber Bragg grating sensors in dynamic pressure conditions. Our goal is to bring forth a richer understanding of the utility and limitations of these commercially available sensor technologies. In parallel, leveraging our expertise in silicon photonics, we are developing novel in-fiber and silicon on insulator (SOI) type photonic pressure sensors. Our goal is to leverage our world-leading expertise in spectroscopy, engineering, pressure metrology, computational dynamics and sensor fabrication to develop a comprehensive, field deployable, cost-effective solution for dynamic pressure measurements. The measurement of dynamic pressure is important for industrial processes, transportation, human health, national security and the environment. The measurement range for dynamic pressure, in magnitude and frequency, is broad and some restriction on both is necessary to develop a successful measurement approach. In bio-medical applications, such as blood pressure measurements, pressure ranges from 10 kPa to 100 kPa, at 100 Hz. In contrast, combustion engines, typically experience maximum pressures of 0.1 MPa to 10 MPa with pressure fluctuations occurring at a rate of up to 30 kHz. Even more extreme dynamic pressure conditions are used in explosive detonation to launch projectiles. Blast waves from battlefield explosions can reach 1 MPa, lasting a few milliseconds. The dynamic pressure from blast waves is a major factor in traumatic brain injury for warfighters as well as affecting the integrity of structures and equipment.